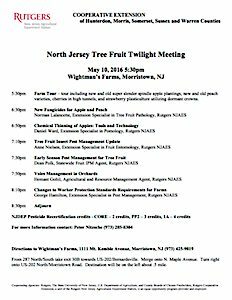 Fruit growers and industry are invited to the North Jersey Tree Fruit Twilight Meeting on May 10 5:30 PM at Ken Wightman’s Farm. The program includes: Wightman Farm orchard tour, fungicide update, chemical thinning of apple, and early season pests update. NJDEP pesticide recertification credits (CORE, PP2 and 1A) will be offered.